We here at OAFE are big fans of H.P. Lovecraft, so we got pretty excited when we saw SOTA's Nightmares of Lovecraft line. The line will be headlined by none other than HPL's main octopoid himself, Cthulhu. Jerry Macaluso, president of SOTA, was kind enough to provide a few details about the line. 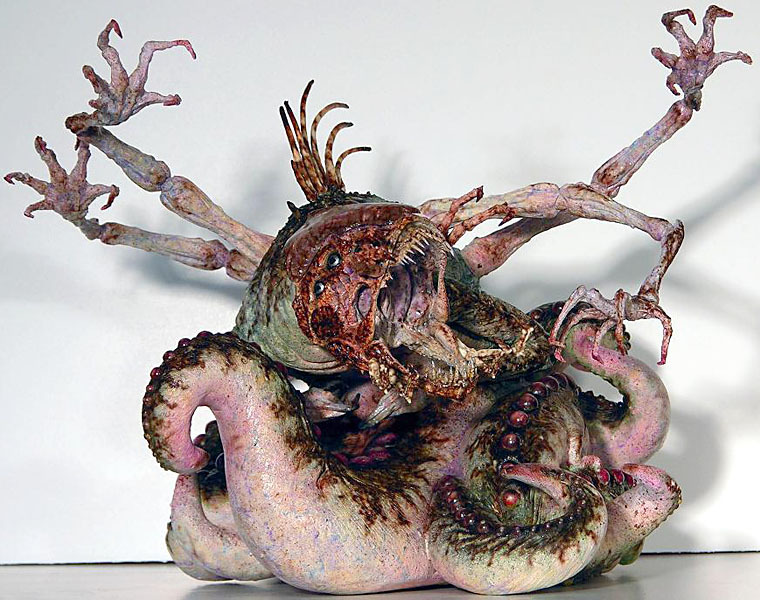 OAFE: When did you first start thinking about doing a Lovecraft-themed action figure line, and why? Jerry Macaluso: I've always wanted to sculpt a Cthulhu. I've had the image in my head for years and one weekend I started doing it for fun. One of my sculptors came in the following Monday and asked if we were doing a Lovecraft line...D'OH! Of COURSE we are! OAFE: The Cthulhu figure stays close to the "classic" depiction of Cthulhu. 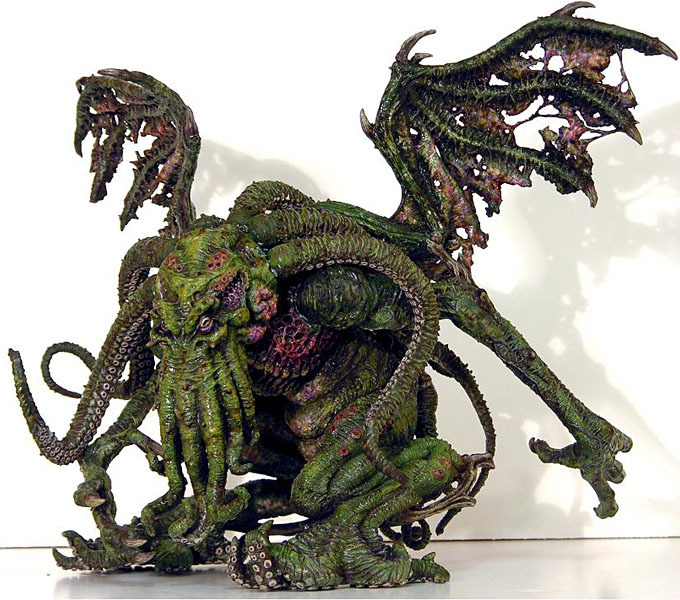 Was the long tradition of artistic depictions of Cthulhu a consideration in that sculpt? JM: I'm sure I was influenced by tons of artwork, though I tried to steer my own path and not get too close to anything previously done. Obviously, you have to give Cthulhu tentacles, y'know? OAFE: In a lot of the Cthulhu Mythos art and literature, Dagon is depicted as a huge, fish-like humanoid--sort of a giant merman. Your Dagon design is a radical departure from that tradition. What was the thought process behind it? JM: Dagon was similar to Cthulhu in that I had a vision of what it looked like from when I was in High School. I was aware to some people we were going way "off-model." 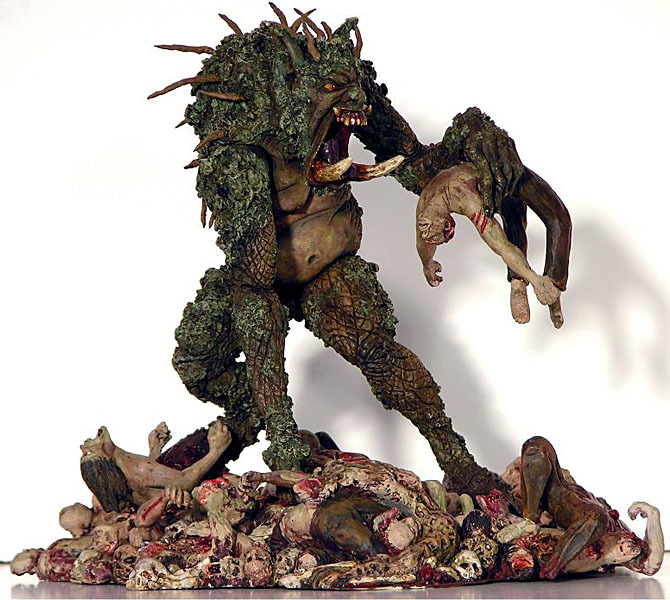 OAFE: Interestingly, the sculpt for the Ghoul is similar to that of McFarlane Toys' upcoming Man-Eating Haunter of the Pits, which is based on a story by Lovecraft's friend and correspondent Robert E. Howard. For example, both figures have large lower tusks, and are holding human remains. Cosmic coincidence, or parallel evolution? JM: That is just one of those strange things, isn't it? We didn't see the McFarlane one until ours was finished and I'm sure they never saw ours, so it was simply cosmic coincidence. OAFE: Was articulation a concern with these figures? JM: It was a concern. I'm all for great sculpts, but I want to pose my figures. I don't think they are mutually exclusive. We're getting a ton of great articulation into the figures and will lose very little sculptural detail in the process. It's just a matter of taking some time to work it out. OAFE: What scale will the figures be in? OAFE: I heard a rumor about SOTA making a rotocast Cthulhu. Can you give us any information on that? JM: It's something some retailers have asked for. I'd like to do it. It would be huge... 12" tall or so... pricey... $40-50. We have to see if the numbers validate it. OAFE: How was retailer interest at Toy Fair? JM: Retailer interest was great. When we first started telling retailers about it, the reaction was less than excited. It wasn't until they saw them at TF and saw the reaction the media was having over them that it started to come to life. OAFE: Several online toy stores already have these figures available for preorder. Are these reliable? Have you set a price point or a release date for them yet? JM: They are reliable. Retail price is $19.99 but you can shop around and find deals on them. We'd like to thank Jerry again for taking a few minutes to chat with us. Keep an eye on the Toy Pirate for more news on SOTA's Lovecraft line, as well as all their other great products. Cthulhu fhtagn!